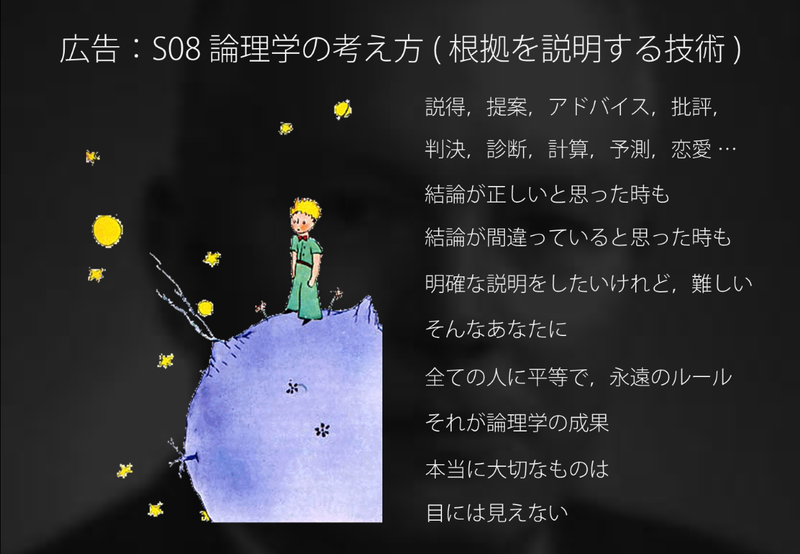 - Antoine de Saint-Exupéry. Le Petit Prince. 論理学（Logic），形式論理（Formal logic），整式（Well-formed formula, wff），構文論（Syntax），意味論（Semantics），命題（Propositions），命題論理（Propositional logic, Zeroth-order logic），真理値表（Truth table），論理結合子（Logical connectives），推論規則（Rules of inference），証明（Proof），ラムダ抽象（Lambda abstraction），関数の合成（Function composition），形式体系（Formal System），形式文法（Formal Grammar），自然演繹系（Natural deductive system），妥当性（Validity），トートロジー（Tautology），矛盾（Contradiction），健全性（Soundness），完全性（Completeness），一階述語論理（Predicate logic, First-order logic, Quantificatioal logic），論説の領域（Domain of discourse），述語（Predicates），量化（Quantification），高階述語論理（Higher-order logic, HOL），演繹（Deductive reasoning），帰納（Inductive reasoning），非形式論理（Informal logic），フォーマル・ファラシー（Formal fallacy），インフォーマル・ファラシー（Informal fallacy），人工知能（Artifitial Intelligence, AI），判決書（Judgement, A decision of a court），医学的診断（Medical diagnosis），Haskell（プログラミング言語），星の王子さま（Le Petit Prince），etc. 冨元 雅仁 published 【eLV】ICTを支える「考え方」シリーズ：S08 論理学の考え方 (根拠を説明する技術）.